Conan - challenging the world, slaying monsters, defeating armies, laughing in the face of death. He steals the treasure, spends it, and steals more. Conan is THE Barbarian. Robert E Howard's epic hero gets the full Munchkin treatment in Munchkin Conan. Play a Cimmerian Warrior or a Stygian Wizard! Wield the Sword of the Phoenix and poison your foes with Black Lotus! Slay Thoth-Amon's minions, Pict raiders, and abominable monsters, and hear the lamentations of their women. 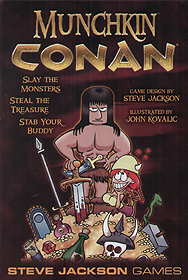 You can play Munchkin Conan on its own... or combine it with the original Munchkin set to double your fantasy fun.